POTTERS BAR, United Kingdom – A mere 10 months since its launch, HARMAN’s Studer is proud to announce that StuderBroadcastAcademy.com, the online version of its Studer Broadcast Academy training course, has amassed more than 1,000 participants across 90 countries. A total of 170 engineers have completed the entire course and are now factory-certified. Of these 170 engineers, over 85% have opted to be listed on the Studer website in a searchable engineer database (used by companies and productions looking to employ Studer Vista engineers). 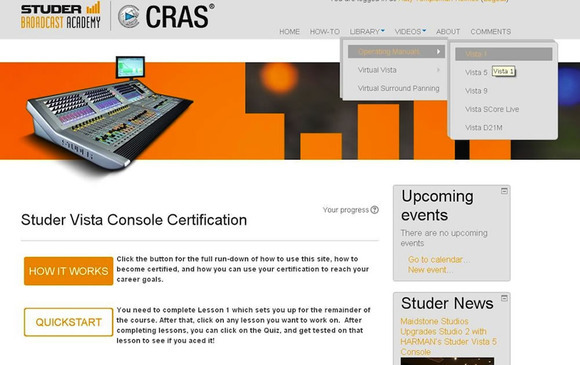 StuderBroadcastAcademy.com is an interactive online course for engineers to learn how to operateStuder’sVista Series digital mixing consoles. The course consists of a series of modules, which participants must pass 100 percent to officially certify as a Studer Vista Operator. The course is structured in an interactive format and students can download the Virtual Vista software that gives them a graphic, active representation of a Vista console. Virtual Vista can also be used for offline console configuration and online remote control of Vista mixing consoles. Video segments, system and technical diagrams, a dictionary of terms and other resources round out the program.